MOMENTS MADE FOR HAND SANITIZERS: Gov. Kenneth Mapp gives U.S. Treasury Secretary Steve Mnuchin a hearty handshake just before he asks him if his signature can appear on U.S. dollar bills alongside Mnuchin’s own. CHARLOTTE AMALIE — Gov. 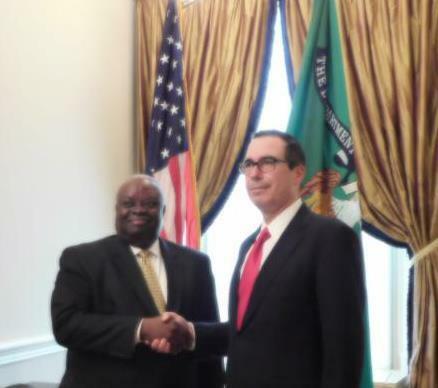 Kenneth Mapp met with U.S. Treasury Secretary Steve Mnuchin earlier this week to discuss the territory’s Economic Development tax benefit program’s administration and expansion. The Department of Treasury has oversight over the Virgin Islands’ ability to grant tax breaks via the Economic Development Authority and other programs. Secretary Mnuchin was pleased with current reports from EDA and the fact that Governor Mapp had rejected unworthy applicants without hesitation. The governor said that he was able to reassure the Treasury Secretary that applicants were screened carefully and that he personally signed off on each agreement. Mapp said it remained critical that the Treasury Department remain confident in EDA’s operating standards. “The Treasury Department will step in and obstruct the program if it feels that we’re not properly policing and ensuring that the people of the Virgin Islands are getting the jobs and economic infusion that the program was created to provide to us,” Mapp said, recalling a period in the early 2000’s when the USVI’s program was curtailed by the Internal Revenue Service. Mapp’s efforts to streamline and expand the EDA program were also discussed and why elected leaders here are allowed to avoid paying taxes altogether. Also the subject of discussion was how the U.S. territories could benefit from proposed tax reforms before Congress, to include bringing tax revenue now overseas back to the U.S., according to Government House. Mapp said that he used the visit to Washington, D.C. to discuss this issue with Secretary Mnuchin and to lobby Congressional leaders, including Senators Orrin Hatch and Mike Crapo and Representatives Vern Buchanan and Tom MacArthur, to ensure that the U.S. Virgin Islands was not left out of the effort to bring as much as $4 trillion back to American coffers.